The new suspension bridge was completed in 2003. It has a 2390 ft long center span and it cost $240 million. It was named the Alfred Zampa Memorial Bridge after an ironworker who built several Bay Area Crossings. After the suspension bridge was completed, Caltrans removed a span from the 1926 truss bridge. This gave our bridge climb team a place to take our recertification exam. Unfortunately, by the time we did all the rigging on this big bridge we were utterly exhausted and so we never passed the exam. After a few months, the rest of the old bridge was removed. Westbound traffic takes the suspension bridge while eastbound traffic drives on the retrofitted truss bridge. 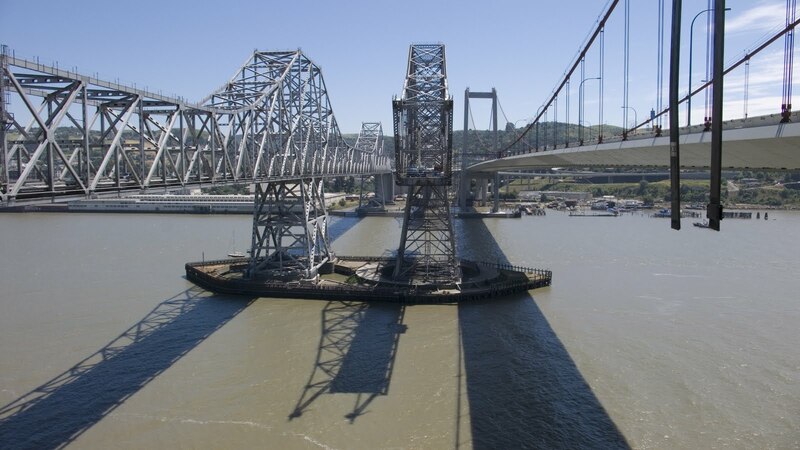 California's Bridges: Bridges across the Carquinez Straits near Crockett (2) by Mark Yashinsky is licensed under a Creative Commons Attribution-NonCommercial-NoDerivs 3.0 Unported License.